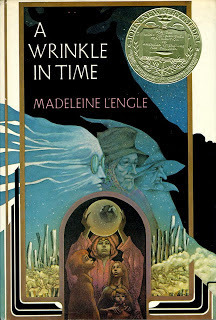 Madeleine L’Engle, the author of A Wrinkle in Time, resisted labels. Her books weren’t for children, she said. They were for people. Devoted to religious study, she bristled when called a Christian writer. And though some of her books had political themes, she wasn’t known to write overtly about politics. That is, until her granddaughter, Charlotte Jones Voiklis, came across an unknown three-page passage that was cut before publication. Meg said, "But Father, how did the black Thing capture Camazotz?" If Mr. Murry, still firmly massaging Meg's limbs, knew that Meg was thinking not nearly as much of surrendered Camazotz as their own shadowed earth, he gave no indication. He said, "Well, Megatron, if you're thinking that perhaps the brain simply marched in and took over all the minds on Camazotz, that IT and the Black Thing are one and the same, it isn't nearly as simple as that." "Well, it was the logical outcome of two things. Of complete totalitarianism in certain countries." Calvin had come back and was standing with a load of wood in his arms. Mr. Murry looked at hime, and Calvin said, "It's like Russia under Khrushchev. Or Germany and Hitler. Countries under dictatorships. Franco. Mussolini. Castro. Mao." ...[S]he said, "But Father, What's wrong with security? Everybody likes to be all cozy and safe." "Yes," Mr. Murry said, grimly. "Security is a most seductive thing." "Well but I want to be secure, Father." "I've come to the conclusion," Mr. Murry said slowly, "that it's the greatest evil there is. Suppose your great great grandmother, and all those like her, had worried about security? They'd never have gone across the land in flimsy covered wagons. Our country has been greatest when it has been most insecure. This sick longing for security is a dangerous thing, Meg...."